President Tayyip Erdoğan signalled on Tuesday that the next phases of Operation Euphrates Shield would be more extensive than the recently-concluded first stage, and would include Iraqi and Syrian territories still held by terrorists. 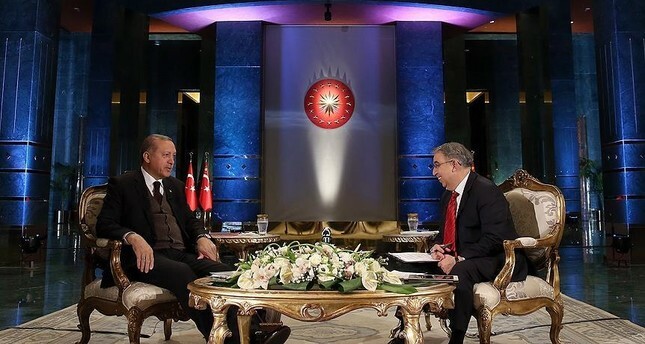 Speaking in a televised interview with NTV, the president said that although the 2nd and 3rd stages hadn't been named yet, future operations would have an Iraqi dimension along with a Syrian dimension. "There is Talafar, there is Sinjar. We have kin in Mosul," he added, referring to Turkmens in the region. Launched on August 24 and carried out with Free Syrian Army (FSA) support, Operation Euphrates Shield aimed to improve security, provide support to coalition forces, and eliminate the terror threat along the Turkish border. It ended on March 29. Erdoğan also touched upon the Kirkuk issue, one of Iraq's disputed territories, and said that Iraqi Kurds's move to hoist the Kurdish flag over goverment buildings in the northern Iraqi city was unacceptable. "The fact that a second flag was raised in Kirkuk seems like an occupation attempt to me. We all know that, historically, Kirkuk was a Turkmen town," he said. He said the current situation in Iraq's Sinjar region was worse than that of Talafar, and that the city was about to become the "second Qandil", or in other words a second headquarter, for the PKK terrorist organization. "There are around 2,500 PKK terrorists there, trying to create this second Qandil," Erdoğan said. The PKK has sought to establish a foothold in the region in the northeastern mountainous outskirts of the Nineveh province, since Daesh was driven out last year by Peshmerga and local forces with the help of the U.S.-led coalition. Turkey has also expressed concerns about the PKK's presence in Sinjar and said it would take measures, including deploying troops, to prevent the terror group from securing a base in the region. More than 1,200 people, including security force personnel and civilians, have lost their lives since the PKK -- listed as a terrorist organization by Turkey, the U.S. and the EU -- resumed its decades-old armed campaign in July 2015. Erdoğan also warned that the mostly Shia Hashd al-Shaabi terror group in Iraq is acting as an invasion and occupation movement in Iraq. "When we look at it all, there is support for Iranian and Persian nationalism based on sects in Iraq. They disseminate it with sectarianism and spread it on the basis of Persian nationalism," he said.